The PS1 survey provides 5 band photometry on millions of stars in our Galaxy. This photometry allows the distance and reddening to every star to be estimated individually. This data set has the potential to dramatically advance our knowledge of the 3D structure of the Galaxy's dust. Currently, the most sensitive maps of the Galaxy's dust are based on the light it emits at long wavelengths, whether in the mid-infrared, the far-infrared or in the microwave. 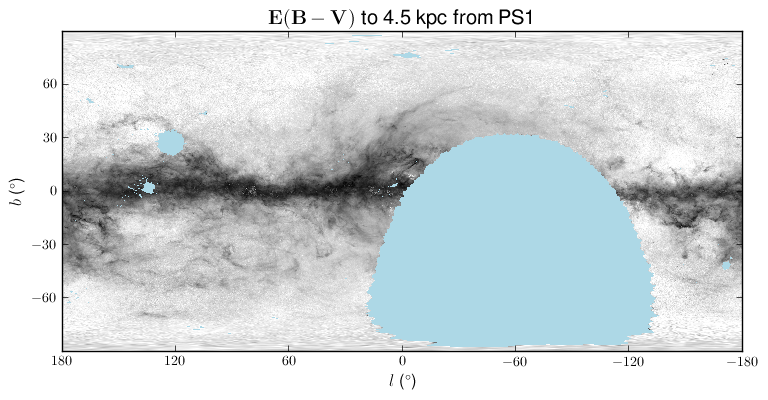 We present here a map of the dust column within 4.5 kpc that has an accuracy of about 30 mmag E(B-V) with a resolution of 7 arcminutes, comparable to the resolution of the Planck and IRAS emission-based maps. Our map, however, is based directly on reddening measurements, allowing the relation between dust extinction and dust emission to be directly measured. Most of the dust at high Galactic latitudes lies well within 4.5 kpc; indeed, the most distant cloud considered in our cloud distance catalog lies at a distance of only about 2.5 kpc, and it resides very near the Galactic plane. Accordingly, at high latitudes both our maps and emission-based maps trace essentially the entire Galactic dust column. The accuracy of our maps can then be tested by comparison with emission-based maps. The plot at right shows our map (top), the Schlegel, Finkbeiner, and Davis (1998) map, and the difference. The agreement at high-latitudes, where both maps trace the entire column, is excellent.